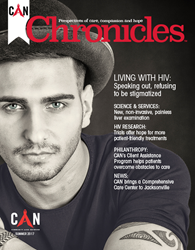 CAN Chronicles magazine will offer perspectives of care, compassion and hope for Florida-based nonprofit serving people living with HIV/AIDS, Hepatitis C and STDs. Florida is number one in the nation in newly-diagnosed cases of HIV, so there is significant need for a community engagement vehicle like this. Consonant Custom Media announces the launch of a new original content platform for Community AIDS Network (CAN). CAN Chronicles magazine will provide an original storytelling platform for CAN, engaging its various communities with stories related to CAN’s mission and its people, and the medical, dental, psychological, educational and counseling services provided at its statewide Comprehensive Care Centers. Consonant Custom Media provides engaging, original and sustainable storytelling for hospitals, health systems, academic health centers, nonprofits, foundations and others who want to make more meaningful connections with their communities of interest. We create original content that is truly consonant, or in harmony, with our clients' brand values. Clients use our original content platforms strategically, to reach specific objectives in perception management, sales, service line development, donor development and engagement, and government relations. Reach us online at http://www.consonantcustom.com or call (941) 309-5380. Community AIDS Network (CAN) has been serving the needs of the HIV/AIDS community in Sarasota and across Florida for more than 25 years. CAN is a private, nonprofit organization dedicated, through its clinical arm – Comprehensive Care Center – to the treatment, care and continual wellness of people living with the HIV/AIDS, Hepatitis C and STDs. CAN owns and operates 26 medical clinics throughout Florida, offering medical, dental, psychological and lifestyle counseling to all patients, regardless of their financial situation, insurance status or ability to pay. Information about CAN services and clinic locations can be found online at http://www.cccsrq.org.